In what material do you work? I personally hand sculpt my work in clay even on the monumental scale. What is the final material? Bronze is my preferred material for the finished sculpture. As I am sculpting I am envisioning how it will respond to the depth and shading of bronze when it is complete. How does the clay sculpture become bronze? My work is “ cast” by the traditional “cire perdue” method in a specialized fine art bronze foundry. 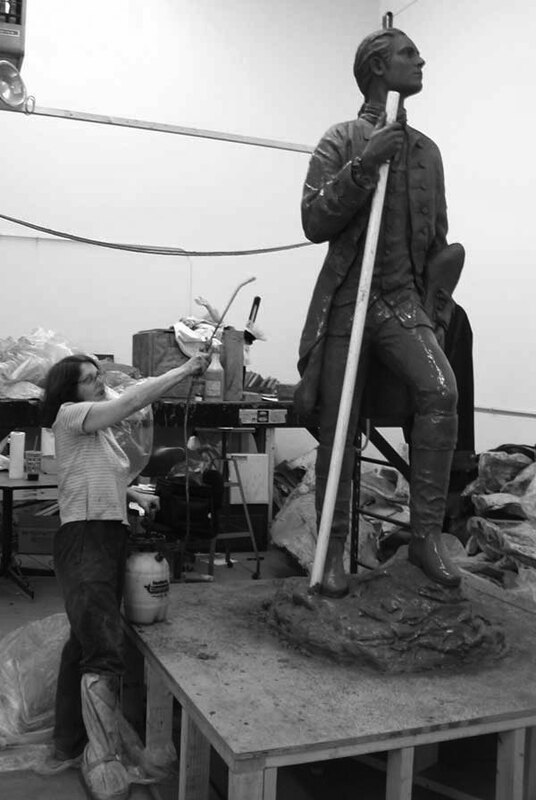 This is a precision process whereby a molding material is applied directly over my original sculpture. This mold is then removed and filled with a special wax. The wax version of the sculpture is pulled from the original mold and encased in a liquid coating that hardens forming a casing or shell around the wax sculpture. When molten bronze is poured into openings in this shell , the wax sculpture evaporates. The molten metal fills the chamber left by the wax. When the metal cools it is the final bronze sculpture. The bronze sculpture is then ‘finished by further polishing and the application of color or patina. How long does this take to accomplish? It may be many months to create the sculpture depending on the size and complexity of the project and at least eight weeks to have it cast in bronze.